Strokes, which occur when blood flow to the brain is interrupted, result in the death of brain cells. Depending upon the area of the brain that sustained damage, survivors may have lasting effects including speech difficulties or loss of function and weakness in a limb. Recovering full, or nearly full, function is possible. However, this requires many months of intense therapy, which is costly and can be logistically challenging for patients who have to travel to see a therapist. Nanotechnology, which offers powerful new possibilities for targeted cancer therapies, has been generating a lot of excitement in the cancer research community. Northwestern University scientists recently developed specialized nanoparticle that can deliver a drug directly to a cancer cell’s nucleus — an important feature for effective treatment . Researchers at UCLA’s Jules Stein Eye Institute and colleagues have successfully used specialized retinal cells derived from human embryonic stem cells to improve the vision of two legally blind patients. 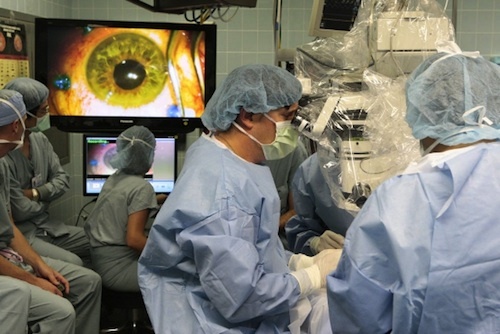 The trial was led by Dr. Steven Schwartz, opthalmologist and chief of the retina division at the Institute. Although the results are extremely promising, only two patients were treated. The trial will have to be preformed successfully many more times before the procedure can be accepted as an option for care. Nevertheless, the preliminary findings represent a milestone in the therapeutic use of stem cells and may pave the way for a new therapy to treat eye diseases. The research was recently published online in the journal The Lancet. The Is My Cancer Different? campaign urges patients to ask their doctors a crucial question — is my cancer different? — and provides powerful information on why, when and how it could matter to their treatment choices. 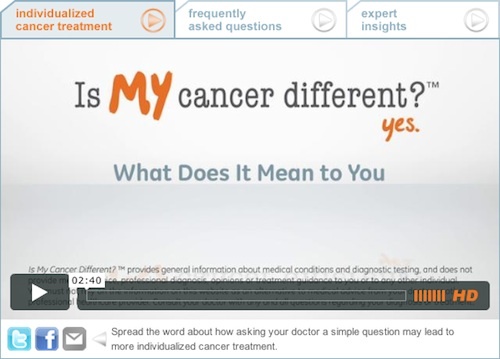 Presented in video format and featuring cancer survivors, physicians, scientists, advocates and Ronnie Andrews, the president of Clarient, the personalized medicine campaign covers what indivdualized cancer treatment means, what makes a patient’s cancer different, treatment decisions, expert insights and more.